Property investments have been such a strong investment for such a long time that it can be hard to remember a few facts. • That property should be priced, in large part, to reflect the income (rent) it can collect. • That property should move upwards over the long term in line with income. • That property can fall in price. Looking at figures over the last 35 years however, you’d be hard pressed to remember those three facts. Here are some graphs from the Economist that we highly recommend that illustrate how removed from the fundamentals property has become. Falling interest rates: the missing factor. Valuations of property have benefited from tax benefits, emotions and a general belief in the safety of property as an investment. All can be reversed more easily than you think. The factor often missed is interest rates, which have generally been on a general trend downward over the last 35 years. Bond investment giants like Bill Gross call it the great bull market. Bonds benefit as rates fall. Lower interest rates alongside the broadening and loosening of the banking system generally have allowed many people to bid property prices ever further upward. 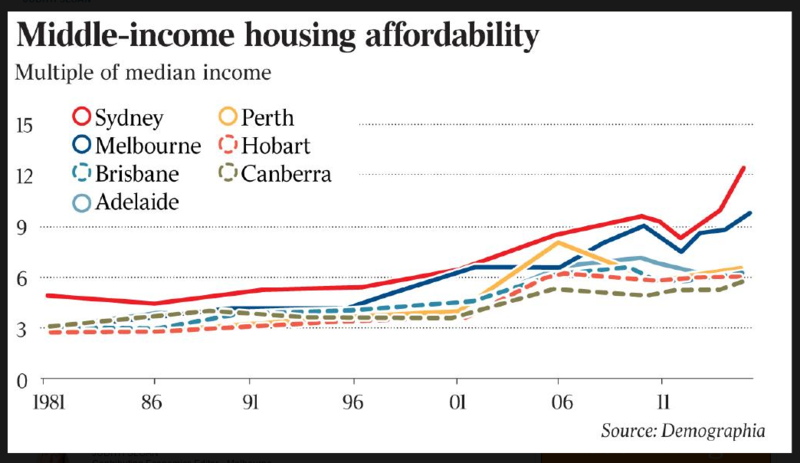 Now many forecasters use measures like property prices as a multiple of income and while that’s useful, it misses something fundamental and practical about how people decide what their budget is for a property. The average person looks at how much they can afford to pay each month in repayments, with a margin for error (that’s if they are smart). Assuming they buyer can afford a stable $40,000 in interest per year, you can see how reducing the interest rate can increase the demand for property. The process will also work the same in reverse. As we are now seeing in the United States is that interest rates can rise again. This isn’t yet a wide ranging phenomenon with Japan and Europe still with negative rates and Britain with ultra-low rates. Sooner or later however other countries are going to raise interest rates, either to prevent excessive capital leaving and/or to reduce inflationary pressure as this cycle continues. That it will cool the property market also seems quite certain. It’s easier to achieve a good return when the cost of finance is so low. It’s the biggest variable cost after all. 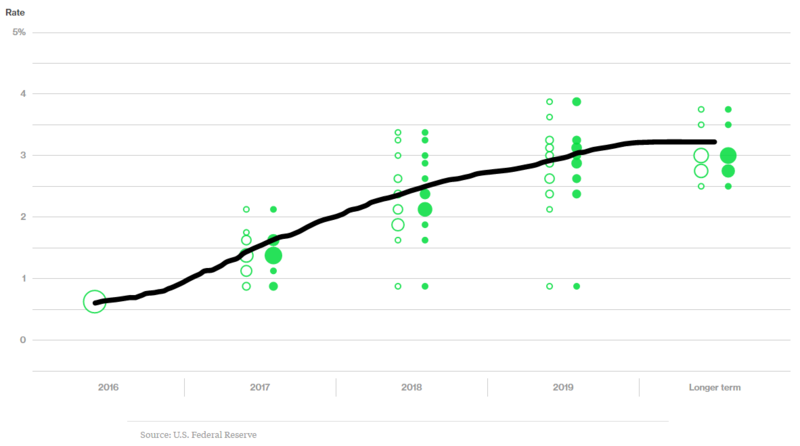 With apologies for the poor hand-drawn trend line, it seems clear that the trend is firmly up when you look at the US Federal Reserve “dot plot”. Even if rate rises so far have been slower than forecast, trend is clear and a Federal Reserve interest rate of 3% or thereabouts seems a fairly certain estimate. If you thought that higher US interest rates would not affect your home country, then you are probably in for a surprise. There were two little noticed moves that shows how the world financial system will be forced to respond to higher US interest rates. The first was China, which lifted its interest rates within hours of the US announcement. The second was two of the four biggest Australian banks, Westpac and National Australia Bank, who both raised rates without any movement from the Australian Reserve Bank. The link between these movements might not be obvious to some, so let’s spell them out. The Chinese move was done to protect the RMB. If the US were to have higher interest rates, then this would encourage movement of money out, thus putting further downward pressure on the Yuan at a time when the Chinese government would prefer to avoid further outflows. Although many countries right now may seem to think that a weaker currency is good for the country, due to export promotional effects, this is likely to end soon. A weaker currency with resurgent inflation could help cause capital flight and crunch, typically in an emerging market country with a poor balance of trade. But they aren’t the only ones competing for flighty capital. The Australian bank’s higher rates reflects this pressure also. These two banks, like many internationally, rely in part on wholesale funding. This means they borrow money from other banks. As US interest rates rise, the cost of this funding also rises, even though both banks are rated AA-, which is one of the higher ratings in the post financial-crisis banking world. Many other banks around the world, particularly in developing economies will face higher costs and will need to manage it either by raising their lending costs or eating the loss of margin that it entails. Either way, borrowing and lending money will become tougher as the US raises interest rates. The Property – Interest Rate Conundrum. Australia is a good case in point. Currently it has historically low rates at 1.5% which has helped support the economy through a slower period whilst inflating a rather hot property market in Sydney and Melbourne even further. This has led to a large increase property prices as well as personal debt, mostly in the form of mortgages. It has seemed to go well, with the average Australian net worth being some of the highest in the world, up there with Switzerland. Much of Australia’s personal wealth however is based on equity of several investment properties and is attached to a lot of debt. It could largely evaporate if property prices fell 20%. Many Australians rely on government tax subsidies for loss making property investments, called negative gearing. Those rules too are continually being debated too. There is a good chance that many property buyers would be impacted with interest rates even 1% higher than now which is still well below the Australian long term average. The property market would probably retreat noticeably if rates rose 2%. Analysts estimate that a rate rise would have triple the impact that a similar rise would have in the 1990’s. Knowing this, the Reserve Bank will need to be very careful in raising interest rates since falling property prices, lead to construction job losses and a general collapse in consumer confidence and spending. The choice for the Australian Reserve Bank thus becomes, triggering a recession through higher rates or avoiding higher rates and allowing conditions to get further misaligned, have higher inflation and a declining currency and delay reckoning to another day. This is a choice that central banks around the world will increasingly face in coming years. Still, the wholesale funding that many banks use, may mean that it is out of their control. If you own Australian property, a 1.5% interest rate rise is something to consider. If the world learnt anything from the US financial crisis of 2007-10 is that general residential property price falls hurt the real economy via the banking system in severe and prolonged ways. The recent example is far from the only one from history. Economists like Hyman Minsky, who died in 1996 have made careers out of studying property/banking/financial collapses, how they occur and what to do about them. A quick Amazon book search can find you quite a catalogue of previous banking catastrophes. So does that mean a collapse is coming? The lesson today isn’t that the world is going to end. Far from it. A good crisis is a wonderful investment opportunity. The lesson is that debt should always be used carefully and worst case scenarios should be understood and planned for because these cycles repeat. Now that interest rates are starting into their upward swing, debt reduction should be a priority. The cycle continues to turn. It is a good idea to plan for higher rates and ideally be ready to invest and pounce on bargains when, eventually, the inevitable crisis happens again. For that opportunity you should thank low interest rates that enabled millions of property speculators to over-confidently leverage themselves excessively over the last 35 years.